Click here for registration form. Email completed forms to mgarrett@hputx.edu. Thanks to everyone for registering early for camp! We are looking forward to another record breaking group at our camp this year. Here are a few things to keep in mind as the camp draws near. 1. You will need to purchase your own Large School Packet before you come to camp (Treble Packet for Girls, Men’s Packet for Boys). You can purchase this music through Penders Music in Denton or Carrollton. MUSIC WILL NOT BE AVAILABLE FOR PURCHASE AT OUR CAMP. Be sure you do NOT purchase the Small School Packet. Be sure to have your music in a folder with a pencil. 2. The All-State Recordings will be available this week online. I will send you a link that has your part and the accompaniment. 3. This year’s music is substantially more difficult that in years past. If you have not already purchased music and started to practice or attend other camps, you may find yourself overwhelmed when camp starts. We HIGHLY encourage you to look at the music before our camp as it should a REFRESHER CAMP not an introduction to the music. 4. The audition rounds and what pieces will be auditioned at each round will be released this week. We will also post that information for you as soon as we have it. Feel free to send me (jbrown@coppellisd.com) or Mr. Carruth (ccarruth@coppellisd.com) if you have any questions. We are really excited to have each of you at this camp and look forward to a wonderful year. We look forward to seeing you all at our Madrigal Retreat from 2 to 9 pm on August 22nd and 23rd. 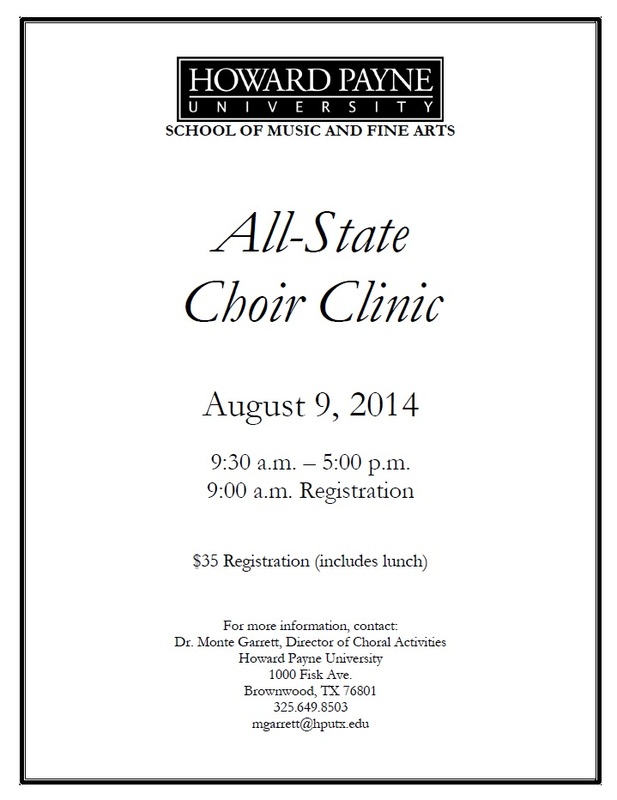 Or hopefully even sooner at the CHS All-State Choir Camp!